This paper traces my research of film genre from its origins in the earliest days of cinema to contemporary theory, outlining a number of problems with the theory that gave rise to some frustration as a screenwriter. The paper then outlines how Mikhail Bakhtin and Valentin Voloshnikov’s theories of discourse helped overcome these issues, reconciling some of the theory with how genre is used in filmmaking practice generally, and in my own practice with the writing of a screenplay, Burnt, in particular. I spent many, many months exploring the history and nature of genre in order to inform my screenwriting practice, and this journey almost ended in frustration when text after text, theorist after theorist, failed to adequately explain how genre operates in practice. Quite by accident I found a solution to many of these frustrations using theories of discourse proposed by Mikhail Bakhtin (1952) and Valentin Voloshinov (1929), ultimately allowing me to complete the screenplay with a greatly increased level of confidence in the power of genre. This paper traces my research of film genre from its origins in the earliest days of cinema to contemporary theory, ending with an outline of the key problems that gave rise to my frustration as a screenwriter. The paper then outlines how Bakhtin and Voloshinov’s theories of discourse helped overcome these issues, reconciling some of the theory with how genre is used in filmmaking practice generally, and in my own practice with the writing of a screenplay, Burnt in particular. Filmmakers, audiences and critics have used ideas of categorisation since movies were first made. The distributor of foreign films in America between 1898 and 1928, the Kleine Optical Company, listed its films (1905, 36) as “comic, mysterious, scenic, personalities, and three types of story: historical, dramatic and narrative”. Poet and film critic Vachel Lindsay (1915, 2) divided the photoplay (motion picture) into three categories: the photoplay of action, the intimate photoplay, and the photoplay of splendour (sub-divided into fairy, crowd, patriotic and religious splendour). In Australia, newspaper reports of film screenings as early as 1901 used the categories “musical comedy” (The Biograph at His Majesty’s Theatre 1901) “drama” (Drama by Animated Pictures 1908) and “melodrama” (Pantoscope at the Criterion 1906), and by the 1930s a wide range of categories were in common use, including “romantic drama” and “mystery drama” (Cinema Notes 1930) “Western thriller” (Majestic Theatre, 1930) and “war film” (War Film in the Making 1930). By the early 1930s, after the commercial success of films like Dracula (1931) and Frankenstein (1932), the category of “horror film” had become well established in film advertising and media discourse (The Mummy at The Grand 1933). when film critics talk of popularity cycles in Western films they are referring to the more pretentious productions. The “quickies”, which are often never shown in the big cities, have never experienced a serious slump, or undergone any big changes. He then questioned the applicability of a short-term categorising label (the cycle) to a category that included types of films that had been popular over an extended period of time, with audiences all over the world. the musical in all its forms (from backstage and campus to comic opera) has been with us fairly consistently since the first talkies … other types of films come and go, but the show with music still has its public. Cycles came to refer to categories that arise to exploit short-term market opportunities as the result of a successful film whose identifiable elements are easily reproduced. Klein (2011,4) suggests this is because they are “so dependent upon audience desires”. By comparison, it was the attribute of timelessness that came to distinguish film genres, a label also used to describe groups of film from the 1930s onwards. From the late 1940s it was these more durable categories that became the subject of investigation by more scholarly analyses of films in magazines like Commentary and Cahiers du Cinéma. Among the earliest of these are Robert Warshow’s 1948 analysis of the gangster film, and André Bazin’s 1953 study of the Western. While Warshow (1948, 144) does not use the word genre, he notes that the gangster film and the Western are examples of “the movies’ constant tendency to create fixed dramatic patterns that can be repeated indefinitely with reasonable expectation of profit.” He calls these categories “types” and suggests they are mediating ideas where “conventions have imposed themselves upon the general consciousness.” Bazin (1953, 140) comes to a similar conclusion: “the Western must be something other than its form.” Both these theorists are pointing to the complex perceptual content/function of genre, with Warshow (1948, 146) noting the existence of the “aesthetic effect” of the genre film, while Bazin (1953, 142) talks of its “essence”. many people wish to avoid the whole question of genre because it is held that it will lead to the laying down of rules and regulations that will arbitrarily restrict the freedom of artists,” whilst, more recently, Langford (2005, i) warns (in the opening paragraph of his book) that “genre remains a perplexingly evasive and, philosophically speaking, idealistic entity. Given these problems, theorists shifted their focus to an analysis of how genre was actually used. Ryall (1975, 28) notes “genres may be defined as patterns/forms/styles/structures which transcend individual films, and which supervise both their construction by the filmmaker and their reading by the audience”. For Ryall, the most appropriate model of genre is a three-way relationship between filmmaker, audience and film. 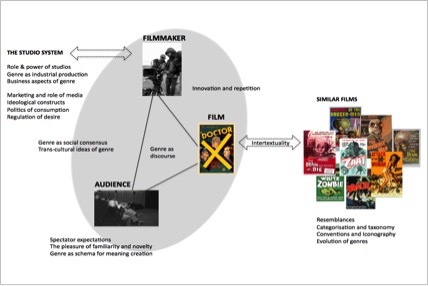 An expanded version of this model (see Figure 1 below) shows how some theorists focus on the filmmaker (production) vertex, investigating the power of Hollywood (Neale 2000a, 231), the industrial aspects of genre, the relationship of genre to ideology, and the regulation of desire. Others focus on the audience (spectator) vertex, examining audience expectations, hypothesis-making, the pleasure associated with repetition and difference, (Neale 2000b, 99) and the use of schemata (Bordwell, 1985, 13) in meaning-making. At the vertex of the film is the site where audience and filmmaker interact, and where Goodnow (2010, 13) suggests the notion of intertextuality lies: where the spectator brings into play other films with shared codes. Genres are intertextual in that any genre exists only because it contains a number of specific films linked in some way, and it is the relationship between these films that an individual “uses” to the extent that they have been experienced (either seen in full or part, read or heard about, or made aware through publicity, advertising or other discourse). Individuals never experience “the Western”, “the musical” or any genre directly, but rather understand genre through the interrelationships of specific films and the intertextual relay of discourse that accompanies them. The body of films that make up a genre is a contested site where ideas of resemblance and iconography exist, along with broader theories of categorisation systems and the way they change over time. While most commentators now accept that the significance of genre can only be understood by including the complexities of audience perception in the analysis, they still gravitate towards a model that locates genre in the film, placed there by the filmmaker as an object to be interpreted by the audience. Some theorists acknowledge difficulties with this, Neale (2000b, 28) concluding that genres are “ubiquitous, multi-faceted phenomena” and Altman (2004, 14) describing genre as “only slightly short of magical in its versatility.” There is much grasping here for explanation and a return to the fundamentals of language and meaning, as outlined by Bakhtin and Voloshinov, provides some useful insights, particularly for the screenwriter who wants to put the powers of genre to use in the development of a film noir screenplay set in Australia. Voloshinov (1929, 26), in his critique of structural linguistics, suggests there are two approaches to understanding language. The first—which he calls individualistic subjectivism—places the focus of language creation in the speech of the individual, and sees language as a creative act that emerges from each individual’s psychological and physical peculiarities. The second is named abstract objectivism and places the focus of study on the system of language itself. While individuals are free to make whatever utterance they choose, each can only create meaning to the extent that he/she complies with the “normative identity” of the system of language. In the ensuing critique, Voloshinov (1929, 59) argues that neither of these approaches adequately explains what happens in practice. Language speakers are neither free agents in an unstructured linguistic world, nor are they concerned with applying a form of utterance identical to a normative standard. Rather, speakers construct utterances that maximise the conditions for meaning creation in a specific set of localised conditions. Likewise, the listener does not create understanding by abstract reference to a “dictionary” of word meaning, but by understanding the “novelty” of the utterance in a specific context. The model of discourse proposed by Bakhtin (1952, 82) and Voloshinov (1929, 58) sees a speaker frame an “utterance” comprising a number of “distinguishable significative elements” (words or phrases), which are given “evaluative accenting” to create their value. The utterance, when viewed as a whole, contains “theme” (the idea being expressed or point being made), but theme is not the sum of the meanings of the individual words or sentences, but formed with their help. Distinguishable significative elements are chosen and accented by the speaker with reference to what has gone before, the theme of the utterance as a whole and, most importantly, to the anticipated response of the addressee. The addressee then uses “inner-speech” as a basis of recognition, understanding and evaluation of elements of an utterance (including their accenting) and the elements are decoded within their specific context. For these two theorists, orientation of the word towards the addressee has an extremely high significance. Voloshinov (1929, 58) points out that “word is a two-sided act. It is determined equally by whose word it is and for whom it is meant” while Bakhtin (1952, 87) argues that at the heart of this model of discourse is the idea of “addressivity”, that in order to create meaningful discourse, we shape our communication with an understanding of what has gone before, the current context, and the disposition of those to whom we communicate. Theories of film genre developed partly as a reaction to auteur theory that saw the film (utterance) as the creative product of one person, the director. Auteur theory places the individual director and his/her creative peculiarities as the focus for understanding the films that are “created” by that director in much the same way that individualistic subjectivism operates in linguistics. The focus of attention becomes the speaker/director and the markers in “his/her” films that correspond to a psychological/historical understanding of that person. Genre theory, in opposition to auteurist subjectivism, emerged to establish a synchronic, objective, external system of rules and laws (for example specific iconography, visual conventions, dominant themes) that exists separate from the process of film creation or reception, and which can be defined and described in much the same way that language can be codified in a dictionary. This approach shifts the focus of analysis from speaker to utterance, from director to film, and most accounts of film genre are attempts to distil the “language” of a given genre from a body or canon of films. While solving some of the problems related to auteur theory (particularly its application in the studio system), genre theory has been unable to fully account for screen practice, when applied to the actual social conditions and specific context of any given film’s production and reception. One of the most significant problems encountered with a synchronic, objective view of linguistic phenomena is how to interpret the historical unfolding of language. Voloshinov (1929, 31) notes that rationalists like Saussure “regard history as an irrational force, distorting the logical purity of the language system”. In his view (1929, 32) language is a “ceaseless flow of becoming” without a moment in time when the system was created. Film genre theorists have similar difficulties with time, and attempt to overcome the idea of an endless flow of change with models of rational development (genre “evolution”) that often feature a “classical” phase of the genre. Such models applied to the Western have regularly and erroneously resulted in announcements of the death of this genre (Berg, 2000) or required new Westerns to be classed as “revisionist” in order to protect the status of “classics” and the codified system of the genre. However, if we free a genre from an objective standard, frozen at some arbitrarily determined point in time, we can view any historical development that occurs as a series of decisions necessary or desired at the specific time of production of an individual film to help facilitate meaning creation with the anticipated audience. Furthermore, we can apply Bakhtin and Voloshinov’s model of discourse to screen production. When a filmmaker (meaning the entire set of people and processes that results in a work) creates a film, it contains a number of “distinguishable significative elements” which form the basic communicative units from which meaning will be derived. These may be a single shot of a character and his/her behaviour, a line of dialogue, a scene of action, text appearing on screen, a sound, or combinations of these elements. In selecting the exact nature of any one element during the primary creative processes of writing, directing and editing, filmmakers focus both on how it fits into the overall film (and its core theme) and on anticipating the response of the audience, the film moment’s addressivity. Does this scene advance the story? What camera position best creates the effect I want? How should a character articulate his feelings at this moment? Does this shot fit with the overall production design? These are the typical and primary concerns of filmmakers at work when creating distinguishable significative elements, and decisions to be made are frequently characterised by the idea of “what works best”, with its implicit reference to both the response of the audience and the entire spectrum of past experience. The “evaluative accenting” of moments in film is a complex characteristic of style. Camera angles, lighting, composition, performance choices by actors under directorial influence, editing techniques and music can all be used to create subtle or complete transformations of the meaning of the narrative material. Sometimes these techniques may be foregrounded (jump-cuts, the use of extra-diegetic soundtracks, and extreme camera angles), calling attention to the moment and emphasising the value the filmmaker wishes to attach to the narrative material. Once a film has been completed, it can be seen as a complete utterance made up of a number of distinguishable significative elements. A person experiencing the film will actively respond to both the individual elements (a scene or a set piece of action) and the film as a whole, creating meaning by reference to both his/her inner world of experience (including knowledge of similar films) and the existing social context in which the film is seen. At its core, genre is a set of similarities that links a group of films, or causes them to be considered in the same category: the verisimilitude begets the group. Any attribute of a film could be used as a categorising aid (early pioneers used a film’s length). Using Bakhtin and Voloshinov’s ideas on discourse as a guide, we could categorise using theme (the film as a whole), the nature of various distinguishable significative elements, and/or the evaluative accenting of the material. But, to better understand genre, we need to distinguish between its place in our apperceptive background (our previous experience of the genre that has become more stabilised in consciousness and memory) and its place in the dynamically active process of making sense of a new film as we view it. Genre in these two places takes on different forms, one more abstract, the other more practical. At an abstract level, we can define a set of similarities among films and codify them. By doing so we create genre objects, the Western, the horror film, the road movie and so on. These genre objects are created and maintained in individual memory as a perception, and are flexible to the extent that the individual allows. For example, we each have an idea of what the Western is, based on the films we have seen, the books we have read, the previous discourses we have had, and who or what has influenced our ideas about what constitutes the idea of a Western. At some point in our experience, our ideas about this abstract category may become relatively fixed. Any individual genre object will have both reach (how many people are aware of it) and homogeneity (the degree to which those people have a shared view of the component parts of the genre). Where film production and distribution is more centrally controlled and globally orientated, reach and homogeneity will be greater. As film production and distribution fragments, so does the homogeneity and reach of genre categories. At a practical level however, when in the act of writing or watching a film, the role of these genre objects is subordinated to the process of creating the meaning of the moment. While genre objects will be brought into play, they are—as Bordwell (1985, 31) suggests—only one of many tools, such as schemata about narrative structure, hypothesis framing and the building of cause-and-effect relationships among events. In addition, the conceptual genre object is applied dynamically rather than as a “dictionary”, becoming altered in the pleasurable process of finding new meanings from the specific discourse. Above all else, it must be remembered that screenwriters do not write the Western or the film noir but a specific film, and it is always this unique film and its specific elements that audiences experience. In the dialogic process of watching the specific film, what is in play for the viewer is the active Western-ness, horror-ness, noir-ness of the theme, distinguishable significative elements and accenting, rather than any abstract definition of the genre. When in play, genre can be seen as a key component of a film’s addressivity. A film’s addressivity being a series of decisions made by the filmmaker about the film’s moments that reference films that have gone before, the current context, and the audience’s likely understanding of those moments in context. In addition, a film and its moments will contain a specific otherness (a lack of genre or the narrative material accented without reference to existing structures, patterns and codes), which is the innovation or novelty in the writing. Both the genre-ness and the otherness of the moment combine with the specificity of current context to create the actual felt experience. As a screenwriter creating a film with a specific genre orientation (film noir), understanding the dynamics of meaning creation in this way provided significant freedoms and benefits. What became important in making a connection to my intended audience was not simply focusing on my understanding of film noir as genre object—applying typical genre markers to film moments—but to creatively weave an interplay of the genre-ness of the story with other contextualising elements. In fact, as successive drafts of the screenplay were developed, elements that corresponded to broadly established genre objects were removed or shifted into the background. What the research into genre and the application of Bakhtin and Voloshinov’s insights on discourse made clear to me was that my narrative—despite being set in the 1940s —should have contemporary contextualisation in order to facilitate meaning creation. For this reason, I attempted to ground the story (about a returned soldier trying to uncover the cause of a murder in the cane-fields of Northern NSW) with current social concerns: the experience of migrants and aboriginals in a predominantly white, Anglicized society; the increasing dominance of corporations in the shaping of human society; the desire to escape restrictive family systems; and the problems associated with post-traumatic stress disorder for those who witness military conflict. In fact, the final version of the screenplay (there were twelve major drafts over seven years) has no easily recognisable film noir elements: there is no hard-boiled dialogue (even Australia-style), no easily identified noir template characters, and the screenplay was not written to maximise night-time interior scenes where noir lighting effects might be applied. Rather, the story is Australian first, grounded in a tradition of placing the landscape (in this case an extinct volcano surrounded by burning cane) as a key player, and with clearly recognisable Australian men and women as characters doing their best to get ahead in this landscape. Yet the screenplay for Burnt was developed with a deep knowledge of film noir’s core themes, structure and characters, elements that pervade the narrative as subtle texturing: an opaque story world beyond the control of most characters; a doomed protagonist; unclear moral boundaries; and a strong central female character who could be read as “femme fatale”. All these elements survived the re-writing and restructuring processes but were, as a result of the research, constantly re-evaluated and accented to ensure that their effect on the screenplay as a whole didn’t result in genre stereotyping. The decision to use Bakhtin and Voloshinov’s theories of discourse to unlock my frustrations with genre theory enabled me to feel a confident mastery over the long-established structures and patterns of the genre I was working in, at the crucial level of screenwriting practice. The insights I gained helped Burnt to become accented for its intended audience in the same way that the films we now call noir did sixty years ago, when they were written with a fresh sense of addressivity, unburdened by a self-consciousness knowledge of genre. Altman, Rick. 2004. Film/Genre. London: BFI Publishing. Bakhtin, Mikhail (1952) 2009. “Speech Genres and Other Late Essays.” In The Bakhtin Reader edited by Pam Morris, 81-87. London: Edward Arnold Publishing. Bazin, Andre. (1953) 2005. “The Western: or the American Film Par Excellence.” In What is Cinema? Vol II selected and translated by Hugh Gray, 140-148. Berkeley: University of California Press. Berg, Chuck. 2000. “Fade-Out in the West: The Western’s Last Stand?” In Film Genre 2000 edited by Wheeler Winston Dixon, 211-225. Albany: State University of New York. Bordwell, David. 1985. Narration in the Fiction Film. Madison: University of Wisconsin Press. Burns, Nelson. 1939. “Screen Notes.” The Argus, March 18, 2. Buscombe, Edward. (1970) 2010. “The Idea of Genre in the American Cinema”. In Film Genre Reader III edited by Barry Keith Grant, 12-26. Austin, University of Texas Press. “Cinema Notes” 1930, The Mercury March 7, 7. http://nla.gov.au/nla.news-article29157397. “Drama by Animated Pictures” 1908. The Adelaide Evening Journal, July 6, 2. http://nla.gov.au/nla.news-article208635338. Goodnow, Katherine J. 2010. Kristeva in Focus: From Theory to Film Analysis. New York: Berghahn Books. Grant, Barry Keith. 2012. Film Genre Reader IV. Austin: University of Texas Press. “Hollywood Seeks to Stop Repetition of Motion Picture Plots” 1930 The Adelaide Mail January 18, 14. http://nla.gov.au/nla.news-article63838077. Jones, Lon. 1945. “Hollywood Takes to Murder and Melody” The Sydney Morning Herald, August 1, 7. Klein, Amanda Ann. 2011. American Film Cycles: Reframing Genres, Screening Social Problems and Defining Subcultures. Austin: University of Texas Press. Kleine Optical Company. 1905. Complete Illustrated Catalog of Moving Picture Machines, Stereoptikons, Slides, Films. Chicago. Retrieved from https://rucore.libraries.rutgers.edu/rutgers-lib/26382/. Langford, B. 2005. Film Genre: Hollywood and Beyond. Edinburgh: Edinburgh University Press. Lindsay, Vachel. 1915. The Art of the Moving Picture. New York: The Macmillan Company. Manzie, F. Keith. 1946. “Screen Musicals Withstand All Competition.” The Argus September 21. Neale, Steve. 2000a. Genre and Hollywood. London: Routledge. __________, 2000b. “Extract from Genre”. In The Film Studies Reader, edited by Joanne Hollows, Peter Hutchings, and Mark Jancovich. 98-101. New York: Oxford University Press. “Pantoscope at the Criterion” 1906. The Sydney Morning Herald, September 20, 10. http://nla.gov.au/nla.news-article14794519. Russell, Bruce. 1949. “People Still Go to See Westerns.” The Adelaide Chronicle, January 13. Ryall, Tom. 1975. “Teaching Through Genre.” Screen Education 17 (Winter 1975/76) 27-33. 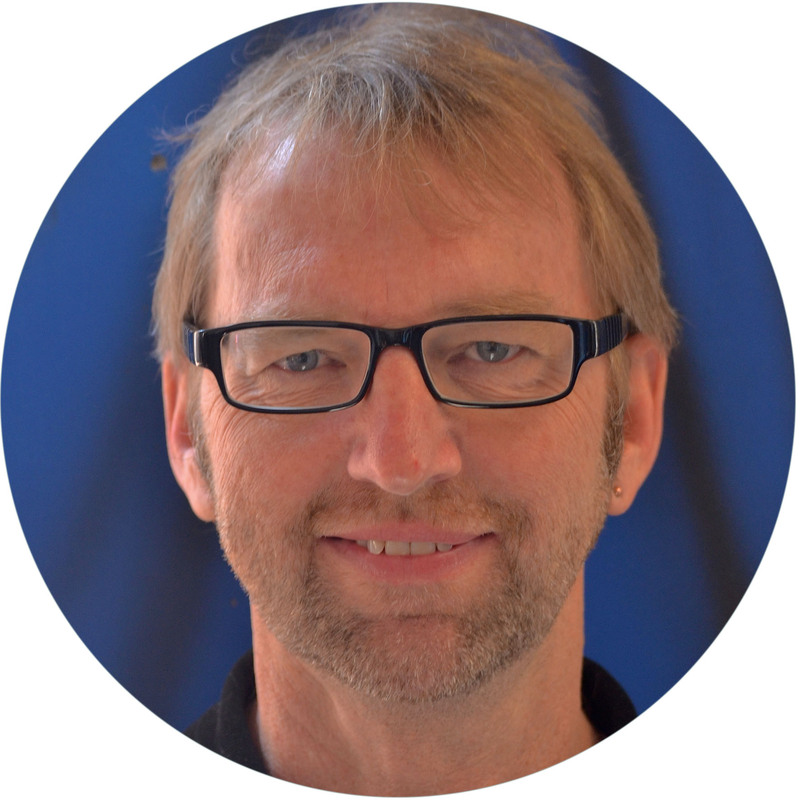 Schweinitz, Jorg. 2011, Film and Stereotype. A Challenge for Cinema and Theory. New York: Columbia University Press. Snyder, Blake. 2005. Save The Cat. California: Michael Wise Productions. Spicer, Andrew. 2002. Film Noir. Harlow: Longman. “The Biograph at His Majesty’s Theatre.” 1901. The Brisbane Courier, September 3, 5. http://nla.gov.au/nla.news-article19157412. “The Mummy at The Grand” 1933 The Advertiser April 3, 11. http://nla.gov.au/nla.news-article74000630. Voloshinov, Valentin. (1929) 2009. Marxism and the Philosophy of Language. In The Bakhtin Reader edited by Pam Morris, 26-37. London: Edward Arnold Publishing. “War Film in the Making” 1930, The Canberra Times January 24, 7. http://nla.gov.au/nla.news-article2273405. Warshow, Robert. (1948) 2004. “The Gangster as Tragic Hero.” In Film Theory, Critical Concepts in Media and Cultural Studies, Volume II, edited by Philip Simpson, Andrew Utterson and K.J. Shepherdson, 144-148. New York: Routledge.